Last Friday was the first tournament of the season for the Panel Built softball team. While they came up short in the two games they played, the general consensus is: they put forth a great effort and had fun doing it! The bats came alive for PBI in that game, where AJ Shook (Steel Line) and Beau Ballard (Install) both hit a home run to clear the bases. Although they played well, the game was lost in heartbreaking fashion 13-12. 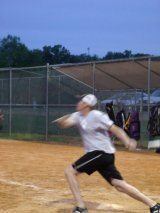 The next PBI softball game will be May 29th at Meeks Park in Blairsville, GA.